First Lady Auxilia Mnangagwa yesterday launched a goat-rearing project in Masvingo Province and donated 1 000 goats to orphanages to kick-start the project in a move aimed at economically empowering the homes. 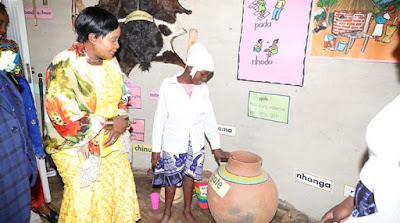 Amai Mnangagwa unveiled the project at Helen Macghie Primary School during her interaction with children from various schools around the province, teaching them on tradition and cultural practices. She recently launched the #NganonaAmai initiative in Harare, where she invites schoolchildren for story-telling as way of preserving cultural values, which she said defined evolutionary identity and instil moral values. Apart from the goat-rearing project, the First Lady handed over an assortment of groceries and blankets to some of the children’s homes in Masvingo. “As a way of ensuring sustainable forces of assistance for the homes in this province, I have launched a provincial project through Angel of Hope Foundation, which will help generate income and other resources for sustaining these children’s homes,” she said. “Ndauya neproject iyi yekutanga ndichiiparurira kuno kuMasvingo, project inoita kuti itichingetere vana vari kumahomes. Zvichaita kuti vana vabatsirikane. In an interview, some of the officials from the homes who were present thanked the First Lady for helping them with a long-lasting solution to their challenges. They said Amai Mnangagwa’s kind gesture was in line with her cultural preservation initiative, where long back families survived on domestic animals such as goats and cattle. The First Lady emphasised the need for the preservation and generational transmission of cultural values. “I am very happy to be meeting with you here children in Masvingo at this story-telling event in promotion of our good traditional culture and values under the support of my organisation — the Angel of Hope Foundation,” she said. The First Lady said folk stories had many benefits that helped reinforce the children’s basic listening, grammar and vocabulary skills. “The benefit of story-telling is one way to better develop the mind of our children in their early ages,” she said.